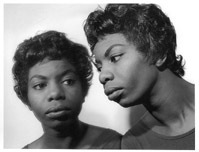 Reflected image of Nina Simone in her Philadelphia apartment. Part of a long series because I wanted to make images that had little reference to her performance side. Prints are 11"x14" or 16"x20"
Each silver gelatin print is handmade and signed by Herb Snitzer. Custom sizes, including large-scale prints are available. Please contact us for specifications. Secure Online Payments via PayPal with Most Major Credit Cards.